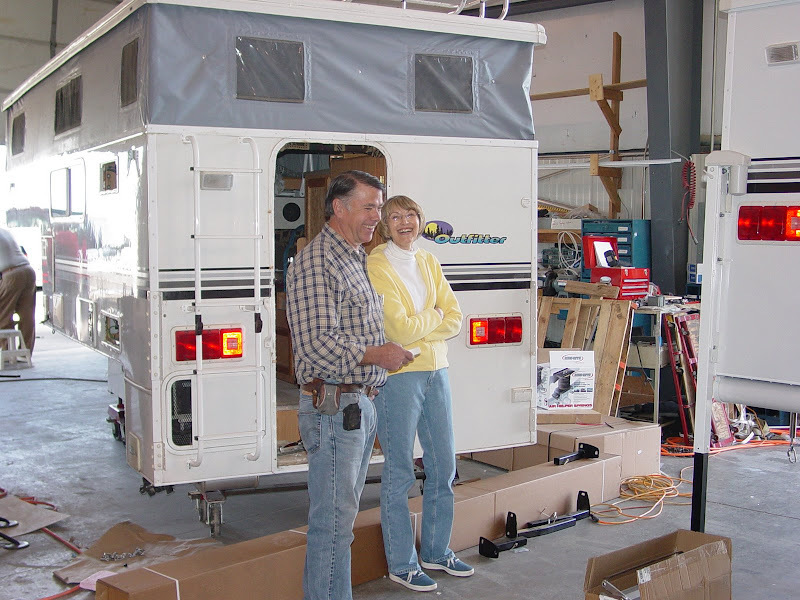 RV.Net Open Roads Forum: Truck Campers: My new Outfitter - photos, finally! > My new Outfitter - photos, finally! Here are some photos from picking up my camper at Outfitter. I took 10 days off, drove out to Longmont, CO and arrived earlier than expected at Outfitter. Bob Ward and his crew squeezed me in, and I was able to camp my first night at St Vrain's Campground about 5 miles from Outfitter. Had to go back in the AM to have some last minute things done (like add on my forgotten solar system...) and then hit the road back to NH around 1030AM. Thanks Murgatroid for all your great directions for posting from Picassa!! Awesome pix! I"m glad you got it to work! The picture at St. Vrain with the pond in the background looks a lot like my picture! That would be funny if you happened to stay in the exact same spot! When I was there, the ranger came by and congratulated me on the new camper. I guess he sees that a lot there! I think you touched on it a bit in the Jamboree thread, but how did the truck and camper handle on the way back? Did you stay anywhere interesting on your way home? on edit - I see you have the cassette toilet (and opted for more storage below). Did Bob have any problem getting your toilet in? Just curious as mine was a hassle, and so was sstan's! Nice camper, how does your Tundra handle with the camper on? Let's see: no, my toilet was there when I got there, but they forgot a few things - solar system, the little covered hole where the electric shoreline comes out, my lower table leg and my propane extention line to run another tank from the ground. This was partly my fault, as Bob and I miscommunicated on the date of my arrival and so they weren't ready for me. But they were great and squeezed me in by working extra hours, which was greatly appreciated! The truck and camper handled very nicely on the way home. I ran into some very heavy winds in KS and MO - up to 25mph gusts which were a little intense, but I managed it okay. I did stay at a campground in IL that was nice, but the other two nights just stayed in ones I could see off the highway. Kind of noisy and not particularly pretty. But I had to get home and back to work. Hi again - I listed all the options I chose, along with a photo, under the Photo Thread at the top of the postings page for TCers. Outfitter and Tundra. Great combo for getting off the beaten path. Of course now, we are expecting some truly spectacular shots of where you are able to get that thing into!!!! Please don't hold your breath waiting for any "Whazoo-like" trips!! At least not until I retire. I have the solution: retire now! Great looking camper, and good option selections. But who's that guy in the first picture?? Great pics Cheryl. Hope you have a great time camping and exploring the east coast. Congratulations on your new camper. Wow, great pix of the installation process, first nights and scenery in the area!